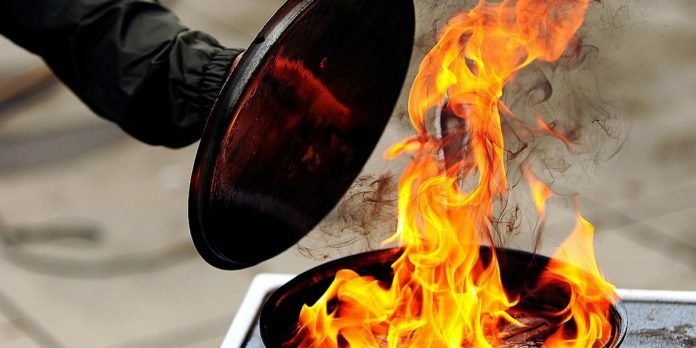 Cooking fires are the number one cause of home fires and home injuries. Just this week the Cape Coral Fire Department responded to two unattended cooking fires. In both incidents, the residents left the oil they were heating unattended while they engaged in another activity. When they returned, the oil had caught fire. Again, in both incidents, the residents picked up the pan containing the burning oil and attempted to take it outside. In the first incident, oil spilled from the pan and both residents required transport to Tampa General Hospital with severe burns to over 70% of their bodies. In the second incident, the resident was more fortunate as she was not injured and the damage to the garage, where she was cooking, was only $400. If you are simmering, baking, roasting, or boiling food, remain in the home and use a timer to remind yourself to check it regularly. NEVER use water on an oil or grease fire. The old saying “oil and water don’t mix” remains true, even if (especially if) the oil is on fire. Instead, cover the pan with the lid, turn off the burner, and leave it until it is completely cooled. Or, use a fire extinguisher. NEVER attempt to remove a pan with oil or grease that is on fire from the stovetop. Even a few drops of hot oil or grease can cause 1st, 2nd, or even 3rd degree burns.